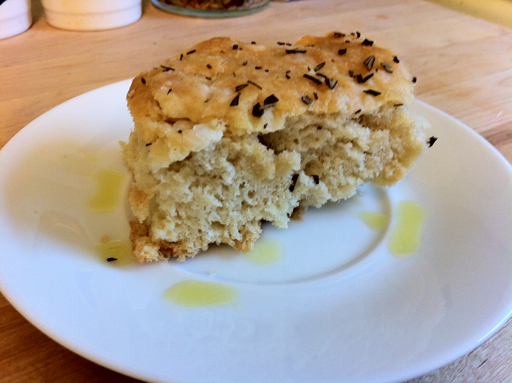 According to Wikipedia, focaccia is a flat oven-baked Italian bread, which may be topped with herbs or other ingredients. Like awesomeness. You all know I like food. Good food. And this is it, my friends. "I can't bake bread--anything containing yeast is too tricky." "Homemade bread is too time-consuming." "My bread-making attempts don't come out right." This recipe comes from this book from Williams Sonoma: "Family Meals" by Maria Helm Sinskey. I have the great fortune of living in the near proximity of a Williams Sonoma Outlet, where I purchased this book for 60% off. Na na na boo boo. It's worth the full price in my opinion, though. So without further ado, here's the first recipe I tried and continue to make over and over due to the fact that it tastes like the "comfort food" section of Heaven. I promise that if you follow the directions (and are friends with your oven), you will have guaranteed success. It is only time-consuming in the sense that it's a lot of start & stop. But if you'll be home for most of the day, give it a whirl--you'll find it's super easy to make! * The temperature given here is the golden ticket. I use a stovetop thermometer stuck under the faucet to show me it's at 105, and then I fill up my measuring cup. Instant success! ** In my opinion, iodized table salt should be banished from planet Earth. Just needed to say that. *** You might be tempted to use kosher salt in place of sea salt. Don't. This is the trickiest part, which is not at all difficult! In a small bowl (I use glass), sprinkle the yeast of 1/2 cup of the water. Wait a few minutes (until the yeast "blooms" or starts looking bubbly/creamy), then whisk until smooth. Whisk in sugar, then 1/2 cup of flour until smooth. Cover with plastic wrap and put in a warm spot (I put mine on top of my stovetop/oven) until the mixture bubbles, about 15 minutes. In the bowl of your stand mixer, stir together the remaining flour and salt & make a well in the center. Pour the yeast mixture into the flour well, and then pour in the remaining water and 1/2 cup of the EVOO. With your dough hook on the mixer, knead on medium speed, adding more flour to reduce stickiness if needed, until smooth 8-10 minutes. * Shape the dough into a ball, place in an oiled bowl (I use a metal bowl for this part), turn the ball to coat with oil, cover tightly with plastic wrap, and let dough rise in a warm spot (again, stovetop/oven) until doubled, about 2 hours. Lightly oil a 9x13 inch baking pan/dish. (I use a glass dish, which I rub EVOO onto with a paper towel.) Punch down the dough in the bowl (I can't wait to let Rhet do this part! ), then transfer the dough to the pan. Push the dough around, stretching it to fill the pan. Drizzle the remaining EVOO over the dough, then sprinkle evenly with the rosemary and sea salt. (I HAVE used dried rosemary in a pinch, but fresh is yummier.) Cover with plastic wrap and let rise in a warm spot for 30 minutes. Preheat oven to 425 degrees. Thanks for posting! Having now eaten this several times, I will be so glad to have access to the recipe now. And may even buy the book at the outlet.